However, there is only one who can wipe away this darkness, get rid of sin and enlighten the world and mankind. 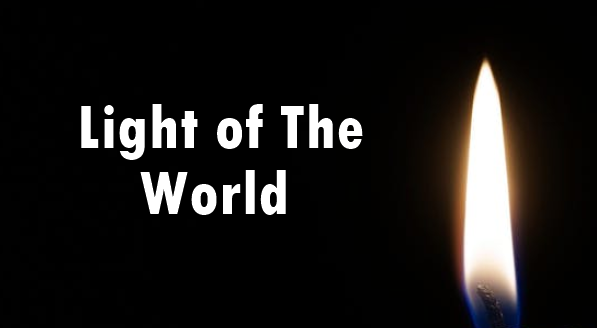 We will go in scripture now to answer the question about who is this One that is the light of the world. Ans: According to the Merriam Websters dictionary, it is something that makes vision possible. What is this light that the Bible speaks of that makes vision possible? (Psalms 119:105) "Thy word is a lamp unto my feet, and a light unto my path." What Word brings this light? (John 1:1,4 & 5) "1 In the beginning was the Word, and the Word was with God, and the Word was God. 4 In him was life, and the life was the light of men. 5 And the light shineth in darkness; and the darkness comprehended it not." Ans: The Word that was in the beginning with God and was God. Now if we continue down to verse 14 of John 1, we will see that the Word that is the light became flesh and dwelled amongst men. Who is the light that became flesh and lived amongst men? (John 1:29) "The next day John seeth Jesus coming unto him, and saith, Behold the Lamb of God, which taketh away the sin of the world." (John 8:12) "Then spake Jesus again unto them, saying, I am the light of the world: he that followeth me shall not walk in darkness, but shall have the light of life." We clearly can pinpoint that the light of this world is Jesus Christ who came to Earth as a sacrifice for mankind yet we rejected the Holy One.